A truly unique engagement option, this wonderful Edwardian three-stone ring features an old-cut sapphire and two old mine-cut diamonds, one a champagne color and the other bright white. The gems are vertically aligned and set in rich 18k yellow gold. New York and New Jersey saw a bit of a jewelry boom during the Art Deco period. WW1 was over, the Roaring 20’s began, and couples began getting married in earnest. And, by all accounts, they were spending more casually after years of wartime thrift. Thus, several jewelers paid more attention to their bridal inventory, which is why we’ve come across some fantastic examples of Art Deco wedding jewelry that were made pretty close to home. Platinum Tiffany wedding band, at Gray & Davis. New York-based Tiffany & Co. needs no introduction, and their reputation meant that the jeweler's designs influenced style across the globe in the 1920s and 1930s. Art Deco jewelry design and manufacture sought to merge two schools of thought. Artisans updated the natural motifs popular in turn of the century Art Nouveau and Arts and Crafts jewelry, giving them more structure. While these previous design movements shied away from industrial assistance, Art Deco jewelers also embraced thoroughly modern production processes. We find many lovely examples of jewelry whose construction benefitted from mechanized aid. Engagement rings and wedding bands made by die striking are perfect examples of this. Die striking is a process by which a piece of metal is pressed, or “struck,” by a machine into a mold. Pieces were then polished and hand-finished for exceptional detail. Art Deco die struck wedding band from New Jersey-based Jabel, at Gray & Davis. In 18k white gold. Popular Art Deco organic design motifs, such as a wheat sheaf or orange blossom pattern, were perfect for encircling these bands. It was an excellent marriage, so to speak, of form and function. Vintage 18k white gold wedding band with orange blossoms. While there is no way to tell for certain, it is possible that this ring was made to imitate a piece made by the Belais Co. in New York. While the company was not the first to develop an 18k white gold alloy, their patent was granted in 1920, and for several years the Belais name, and the "18K Belais" stamp, was synonymous with the metal. King Midas has nothing on this group. The good news? Antique gold jewelry comes in a beautiful array of rosy pinks, rich yellows and even subtle greens that are no longer produced today. Victorian three diamond gypsy ring, in our online shop. 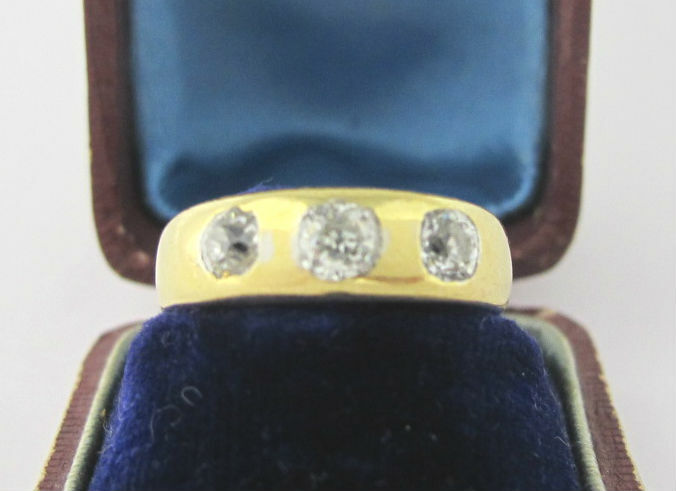 Three bright diamonds are set low in this delightful little 18k yellow gold ring. This ring was made in London in the late 19th century, but it’s still sturdy enough for every-day wear over a century later. A perfect piece for someone who wants a touch of diamondy sparkle swimming in a sea of gold. A true piece of Victorian alchemist’s art. A delicately textured golden flower and green gold leaves grow from a rose-tinted branch. The tiny garden rests atop a slender bangle in 18k yellow. Victorian 18k yellow gold bangle bracelet, available at Gray & Davis. 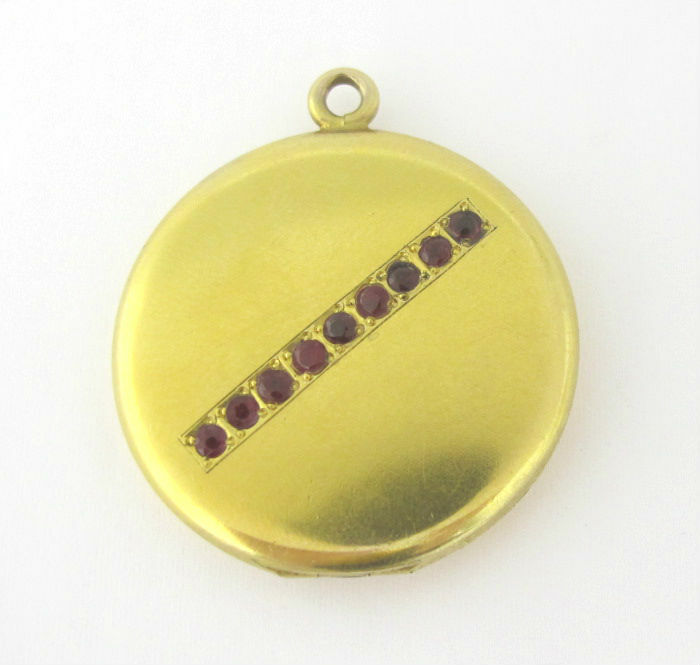 Vintage 14k gold locket, in our online shop. Velvety, 14k bloomed gold is the backdrop of this turn of the century piece. A half-carat stripe of blood-red rubies add contrast, but the gold is the standout here. All it needs is a great gold chain!